Dowsing began with man’s need to find water. Just a few generations ago, almost every farmer could dowse, and find water on his own land. During the Second World War, dowsers found their skills useful for finding other things too, such as unexploded mines or bombs, underground wires and pipes. After the war, many of them kept in touch, and eventually formed the British Society of Dowsers (BSD). This led to the realisation that you could use your rods for almost anything, including tracing archaeological ruins, earth energies, ley lines, and even the source of pain in the human body. It also led to water dowsers developing not just L-shaped rods and pendulums, but flexible V-shaped rods, double-V rods and even bobbers, each carefully refined for a special purpose. And for our first meeting of the year on Thursday 8th January, our President, Peter Golding, gave a talk on using the Double-V dowsing rod to find water. Invented in 1967 by a water diviner named Clive Thompson, an architect and scientist, and Chairman of the BSD for 7 years, the Double-V rod in skilled hands is more accurate and can indicate the strength and direction of search, whereas L-rods can only give a simple Yes (found) or No answer. In order to discover how far underground a blind stream might be, a dowser will walk away from the central source until the rods respond, pacing out the distance covered. According to the Bishop’s Rule, this represents the depth at which water is flowing. Water dowsers should learn all they can about the geology of the land, which types of rock produce the best aquifers, flow and quality of water. Clay is bad news; sandstone, limestone and chalk are best, as they allow water to flow freely in fissures, and can help refine and purify it too. If a farmer needs to know where to sink a bore hole for water for his cattle, or a garden centre wants one to ease their eye-watering water bills, a skilled dowser is worth rubies. If you have a leak in your water system, or your cellar is mysteriously filling up with water, finding out how, why and where is worth diamonds! Our next meeting is 24th January, Trish Mills on ‘Sacred Geometry Made Simple’. The inventor of the Double –V rod, Clive Thompson, a retired architect and scientist, was President of the British Society of Dowsers from 1981 to 1987, and awarded the position of Honorary Life Vice-President. 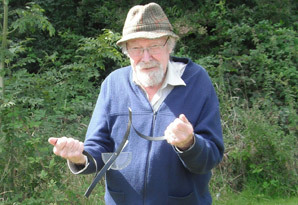 Clive considered that the single V-rod was limited in that it could only flip up or down, ‘Yes’ or ‘No’, so he invented the Double-V dowsing rod in 1967 which can also show field strength and direction, and it has proved very useful for locating sources of groundwater and is accurate in the hands of someone who has mastered the technique of using it. The Double-V rod is made from three strips of flat flexible material, similar to the decorative trim around the top edges of kitchen units. It is like a V-rod but with the junction of the two arms separated by a horizontal section of the same material. The hands grip the top of the two outer arms in a similar way to the V-rod, and the two wrists are then rubbed together as though discharging any static between them. The hands must not be allowed to touch each other again – but if they do, then you must start again by first rubbing the wrists together whilst you are holding the rods. Start by applying tension by moving the hands apart; the centre bar will then bend inwards slightly. If this position is held for about ten seconds, the whole Double-V will spring to life and start ‘twitching’. Clive calls this ‘getting into gear’. It is then ready for use. Do not let your hands touch each other from now on; if you do you will have to start again. Holding it in this position of tension at eye level in front of you, move round in a ‘circle of search’ asking for the direction to nearest stream of flowing groundwater. The mid bar will tilt to the left or the right until you are aligned with the watercourse, when it will remain horizontal. Then, without causing the hands to touch, move the rods to the left (or right) side of your head and walk sideways towards the direction of the stream. The angle of the centre bar will increase slightly, as will the tension, as you approach the stream. (Clive has a protractor on the centre bar of one of his rods so that he can measure this change of angle. It should get steeper as you move closer to the stream; if not, then you could be moving in the opposite direction away from the stream.) When you reach the edge of the flow field, the centre bar will revert to the horizontal position until you reach the other edge of the flow, when it will tilt in the opposite direction. Turn your arms round 90° in front of you with the rods now in line with the stream. The rod will tilt towards the direction from which the water is flowing. The line of the stream can be traced by standing over the outer edges of the flow and swinging the rods in and out of the field as you walk along it. You may then choose a suitable location for a borehole in the centre of the flow anywhere along the stream line.